One 240 hp (179 kW) Argus As 10c eight-cylinder inverted-vee air-cooled engine driving a two-bladed propeller. A small number had a seat removed and racks installed for two 60kg (132lb) depth charges. 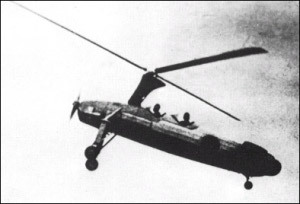 The Ka-1 autogyro was the first autogyro/helicopter design to see operational use in the Pacific. It had a free-spinning rotor to provide lift and a conventional forward propeller for propulsion, giving it a short but by no means vertical takeoff. Its ability to cruise at very low speed made it a good observation platform and it was for this purpose that it first went into production. The ability to descend almost vertically prompted the conversion of a few Ka-1 to antisubmarine use by removing the second seat and installing racks for two 60kg (132 lb) depth charges. These were apparently intended to be flown from the Akitsu Marus, but the only evidence of operational use is as a coastal patrol aircraft operating off Korea and Japan. These seem to have gone almost unnoticed by the Allies and a code name was never assigned.